In charge of the judicial inquiries on bodies of those who seem to have died because of violence or harm; confirms the death, identifies the body, notifies the next of kin or relatives, handles the personal belongings found, identifies the cause and manner of death, maintains death records and files for the death certificate Conducts death investigations in a similar process to that of a coroner but also performs medical autopsies, toxicological and pathological tests, DNA analysis, etc. A coroner is a person who is in charge of the judicial inquiries on bodies of those who seem to have died because of violence or harm. It is his duty to confirm the death, identify the body, notify the next of kin or relatives, handle the personal belongings found, identify the cause and manner of death, maintain death records, and file for the death certificate. He also needs to determine if foul play was involved in the person’s death. He does not perform post-mortem autopsies. On the other hand, a medical examiner is a licensed physician or forensic pathologist who conducts death investigations. He performs medical autopsies, conducts toxicology, documents evidence, collects medical history and other important information, and provides expert testimony in court when necessary. He also establishes the cause of death and the identity of the victim. While a lot of people use the two terms interchangeably, there is actually a difference between a coroner and a medical examiner. Most states in the U.S. use the coroner system, but there are some areas that use both. So how are they different? The word “coroner” is derived from the French word “couronne” and the Latin word “corona” which both mean “crown.” In Middle English, “coroner” referred to an officer of the Crown or the “Crowner,” a person whose responsibility was to make sure that the taxes were paid to the King (the Crown) upon a person’s death. The coroner system originated in medieval England but has been espoused in the U.S. since the 1600s. The majority of the states in the U.S. now rely on the coroner system. The medical examiner system, on the other hand, started in the early 1900s, when people realized that qualified physicians are needed to determine the cause of death. In some areas, especially in rural ones where there is little to no violent crime, full-time medical examiners are not needed and are not available. Small counties usually have coroners instead. It is important to note, however, that some regions or states have both coroner and medical examiner systems. Idaho, some parts of California, Colorado, Kansas, Nebraska, Nevada, some parts of New York, South Carolina, South Dakota, some areas in Texas, some parts of Washington, and Wyoming use the coroner system. Alaska, Alabama, Arkansas, Connecticut, Delaware, Georgia, Iowa, Kentucky, Maine, Maryland, Massachusetts, Mississippi, Montana, New Hampshire, New Jersey, New Mexico, North Carolina, North Dakota, Oklahoma, Oregon, Rhode Island, Tennessee, Utah, Vermont, Virginia, and West Virginia use the medical examiner system. Arizona and Michigan have medical examiners in each county, but they are not necessarily pathologists. Washington, Texas, Hawaii, Minnesota, Wisconsin, Ohio, Illinois, Pennsylvania, and New York use both the coroner and medical examiner systems. Arkansas, Kentucky, Mississippi, Montana, and North Dakota have coroners in their counties, but they also have a state medical examiner. The qualifications for becoming a coroner are generally less rigid than those for becoming a medical examiner. A coroner does not necessarily have a medical background. In fact, a person who works in a different, unrelated field can become a coroner. A medical examiner, on the contrary, is usually a licensed physician who has undergone thorough medical training (usually forensic pathology). A coroner is elected into office and holds a two to four-year term, while a medical examiner is appointed because his position requires professional skills and does not have a specific term length. In general, a coroner or a medical examiner is called when there is sudden or unattended death that is caused by an accident, homicide, suicide, or suspicious circumstances. Depending on the jurisdiction, coroners may have administrative roles at a crime scene or may need to oversee the handling of the body or conduct inquiries in cases of suspicious deaths. A coroner conducts the initial investigation which involves recording the facts about the person’s death. 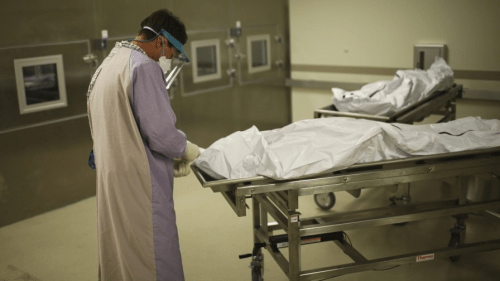 A coroner does not conduct post-mortem autopsies. In cases where autopsies, toxicological tests, or pathological tests are necessary, a coroner often hires forensic pathologists. The medical expertise of the forensic pathologist is imperative to determine if criminal activities or outside events are involved in the death. The coroner will then oversee the medical personnel, technicians, and investigators. Once the cause of the death is established, the coroner then decides if the body can be moved without destroying the scene or evidence. If the other officers (i.e. detectives) agree, the coroner gathers the victim’s personal items (which may be sent for laboratory analysis) and arranges for the body to be transported to the morgue.The coroner also needs to be present during hearings, trials, and must testify when necessary with all the records and documents. A medical examiner, on the other hand, conducts death investigation that involves unusual or suspicious circumstances. He basically has the same responsibilities as a coroner but also performs medical autopsies, toxicological and pathological tests, DNA analysis, etc. He is also responsible for collecting pertinent information and evidence, documenting data, and testifying with relevant forensic data in court when necessary.